What is a Mint Error Worth? he United States Mint produces billions of coins each year at the rate of tens of thousands per minute. At that rate, errors do occur  and most are detected by frequent examination of the coins in production. Other errors, actually die varieties, are less obvious, since the finished coin looks "normal." Error coins look unusual  out of shape, two (or more) coins struck together, partially missing (called a "clip") and many other variations. Varieties, or "die varieties," are coins produced from dies with something different from normal  such as doubled impressions of the date or motto, a design change from the norm, and many other possibilities. In the recent series of 50-state quarters, the Wisconsin quarter was struck from a die (or dies) with an extra leaf on the ear of corn. The media played up this variety as being worth a great deal of money. In actuality, it is not that rare, and when many have been sold at public coin auctions (not on e-Bay), its true value will emerge. A much rarer variety (actually a striking error) occurred a couple of years ago. By some error of die placement, a Sacagawea dollar reverse (back side) was paired with a Washington quarter obverse (front side), creating the very unusual and rare "$1.25 coin." The first one sold at a public auction realized more than $40,000. Since then, a few more have been found. No track record has been published as to the sales records of these oddities. Mismatched coins such as a cent on one side and a dime on the other do occur almost every year, and they are valued in the hundreds of dollars. There are many other variations, and all are quite scarce to rare. 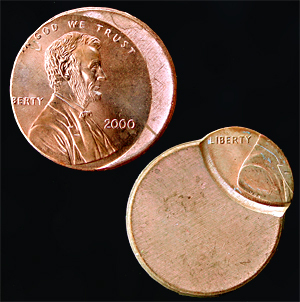 Minor errors as known in the trade include such items as a clip, where a portion of the coin is missing; a cud, where a die break results in a blank portion of the coins; broadstruck, where the coin is broader than usual because the collar holding the planchet was loose or open at the time of striking; and off-center, where the coin detail is only partially showing on the planchet due to a misfed planchet or misstriking. The combinations are quite varied, and for most "minor" errors, the value ranges from a few cents to a few dollars over face value. Perhaps the best-known errors are the bronze cents struck in 1943. About 16 are known. That year, all cents were struck in zinc-coated steel. However, a few planchets from 1942 were still in the system when the new 1943 cents were made. They vary in value from about $30,000 to well over $100,000 for a mint-condition specimen. Seeking mint errors is a fun pastime for many collectors, and often a rewarding one. ©2006, THE SIGNAL · ALL RIGHTS RESERVED.